Though the Norfolk Common Council authorized the burial of "people of colour" in a Potter's Field located between Liberty, Scott, Hawke, and Cumberland Streets in Norfolk in 1827, it wasn't until 1873 that another Potter's Field was established for the exclusive interment of African American citizens. Known briefly as Calvary Cemetery, this burial ground was located at the west point of Elmwood Cemetery. 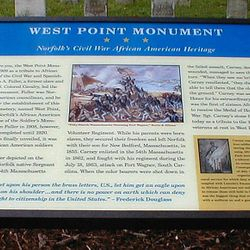 In 1885, with the urging of Norfolk's first African American Councilman, James E. Fuller, Norfolk City Council changed the name to West Point Cemetery. Councilman Fuller further insisted that a section of the cemetery "...be dedicated as a special place of burial for black Union veterans..." Thus, Section 20 was "donated to the Directors of the Union Veterans Hall Association for the burial of the members of the Grand Army of the Republic." Fifty-eight Afro-Union soldiers are interred in Section 20. Under the leadership of Councilman Fuller and the Norfolk Memorial Association, the West Point monument was erected in honor of African American soldiers and sailors of all wars. The base of the monument was completed in 1906 and the statue depicting Sargeant William Harvey Carney was added in 1920. Although Fuller died in 1909, the African American community continued to work for another 11 years to bring his vision to fruition. *"Remembering Norfolk's African American Cemeteries" by Dr. Cassandra Newby-Alexander. 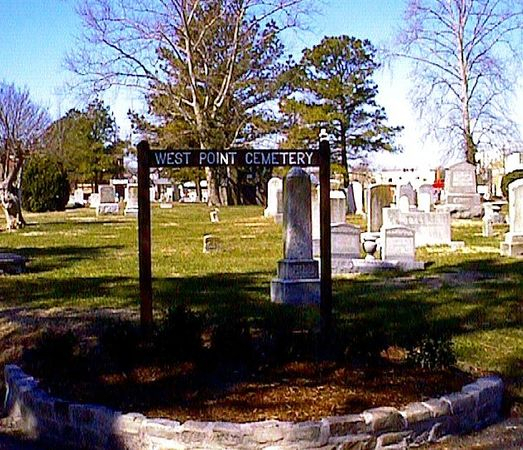 Search for an interment in West Point Cemetery. Access a listing of West Point interments. West Point Cemetery is in great need of conservation. It was the first of Norfolk's eight municipal cemeteries to be added to the National Register of Historic Places in 2007. Though the historic integrity of the landscape remains intact, several monuments have toppled, sunk, and/or broken over the years. A cultural resource management assessment undertaken in 2012, revealed monuments that have been displaced within the cemetery and the location of the interred is unknown. NSCC's goal is to preserve the remaining monuments at West Point along with its single angel and mourning figure for future generations to appreciate and understand the contributions and sacrifices made by African Americans to both the Norfolk community and our country. 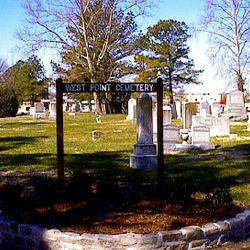 If you are interested in volunteering to help conserve West Point Cemetery, click here.